How Dog Friendly is Breckenridge? Colorado has a reputation for being a dog friendly state, but as an owner of the friendliest pit bull mix in all the land, I was skeptical… Sure we have one of the most beautiful dog parks I have ever been to (check out that view of the mountains at sunset), but how about our stores, hotels, and even restaurants/ bars ? It seems that every other person you meet in Summit County has a dog, and most stores and offices have pet friendly policies. During the warmer months, there are countless patio options at most restaurants and bars, allowing you to bring your buddy along for the adventure! One of my favorite pro-dog dining options is Motherloaded Tavern, complete with a ‘trailer park’ themed back patio and a fun, young, goofy atmosphere. Unfortunately, I have a series of food restrictions which makes it almost impossible to find anything edible (gluten, dairy, sugar, alcohol – pretty much everything that makes life worth living), but that doesn’t stop me from bringing my non allergy challenged friends there to stack up calories on decadent meals like chicken & waffles & macaroni & cheese. Park & Main is another restaurant with an accessible patio and an incredibly delicious (with some healthy choices) menu. They are located in La Cine mall at teh south end of town and are definitely worth checking out for some tasty international options like their incredible Vietnamese Bahn Mi sandwich and their Cuban Sandwich. There are plenty of dog friendly dining options in Breck, but it’s always a good idea to call & check with the restaurant before you pile into the car. Don’t leave your pup at home! It’s a vacation for the entire family. There are plenty of dog friendly hotels/ vacation rentals ect. in Breck. Some include The Hilton Double Tree, The Lodge & Spa at Breckenridge, and several others. Helpful Tip: the water fountain there doesn’t always work, so it is a good idea to bring your own bowl and water for cooling down after playtime. I have never seen as many bicycles in my entire life, as I saw this past weekend alone. Granted, my bike history is short & sweet (involving a bubblegum pink Schwinn cruiser with sparkly tassels and a bell that said “I love my dog”) but I don’t think any amount of long term exposure could have prepared me for the hundreds of bikers I encountered in the early morning hours while dog walking in slippers & pajamas. For those of you who have been lucky enough to see me in the morning (pre-coffee fix) it usually involves large sunglasses, a Phish t-shirt with no bra, and some form of underwear that are pretending to be “shorts”. Obviously not prepared to weave 2 dogs past crowds of bikers yelling “Puppies Ahead!!”. I truly was a tourist in my own town this weekend – er well that is to say I was house/ dog sitting in Frisco, on the bike path. You literally had to drive .3 miles on the bike path in order to access this beautiful home. 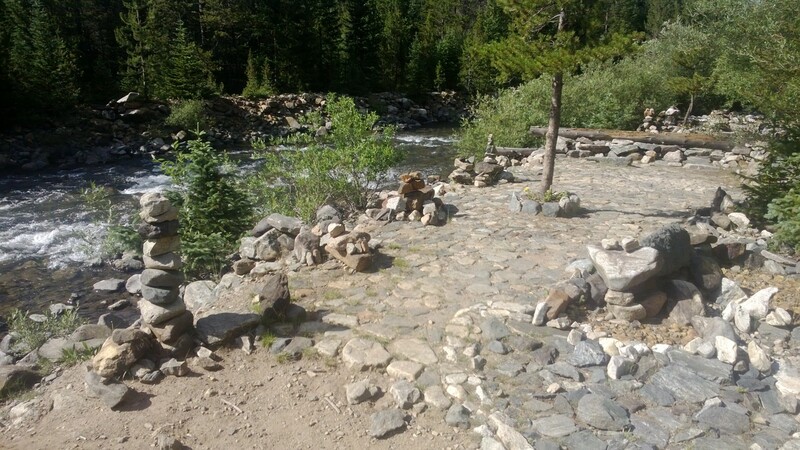 I was able to take long walks with the dogs after work, soak in the hot tub, relax in the steam shower, and make delicious meals in their lovely kitchen – a truly amazing week! Anyways, the homeowners warned me that the bike path was “highly trafficked” on the weekends, but I didn’t know that the Courage Classic was to be riding past my window for two days (try sleeping in when you can hear ever word of a group of cyclist attempting to converse over the sounds of a dozen+ spinning wheels). I’m really not complaining though, because that would be ridiculous! If these folks pay money to ride their butts all over Colorado for a great cause (Children’s Hospital Colorado Annual Fundraiser), who am I to be sour about waking up at 7am on a Saturday ? Besides, I figured these bike nuts must be onto something, so Calley & I grabbed a couple of the bikes (and helmets!) from the house and decided to cruise over to Copper Mountain. The whole trip took under 3 hours with stops along the way and a water break at Copper. It was 14.2 miles with about 2400 foot climb. There’s also a bathroom about halfway right around Officer’s Gulch. Look for beautiful views of the Ten Mile Range, splashy whitewater on Ten Mile Creek, and hilariously serious cyclists in hilariously serious cycling outfits. I’m proud to say I have had my first bike experience in Summit County. Back in Vermont, I was a big fan of functional biking – ya know, biking to class, work, the beach ect… but here, people just ride for the sake of riding. I can’t say i’ll be donning wicking bike jersey’s and riding around Lake Dillon at 5am, but I’m definitely going to start perusing the classifieds for a cheap road bike to explore with! I’ve been very busy the past few weeks traveling back home to the East Coast for family fourth of July Parties, Phish Shows, Waterwheel Foundation Fundraisers and my little sister’s 21st birthday. Upon my return to the mountains I was greeted by Strep throat, a nasty little virus that kept me home from work & also kept me from attending the Railroad Earth, Galactic & Greensky Bluegrass show at Red Rocks that I had tickets to. So sad. Anyways, after moping around for a few days, my friends came over and inspired me to get outside, so yesterday, after indulging in a heavy bacony breakfast, we drove up to Vail Pass to experience peak wildflower season in Colorado. I was not prepared for the variety, the vivid colors, or the sheer volume of wildflowers that sprinkled the mountain meadows. After getting off I70 at Exit 190, we crossed the highway and took the dirt road a little over 2 miles to the trailhead for Shrine Mountain Trail. 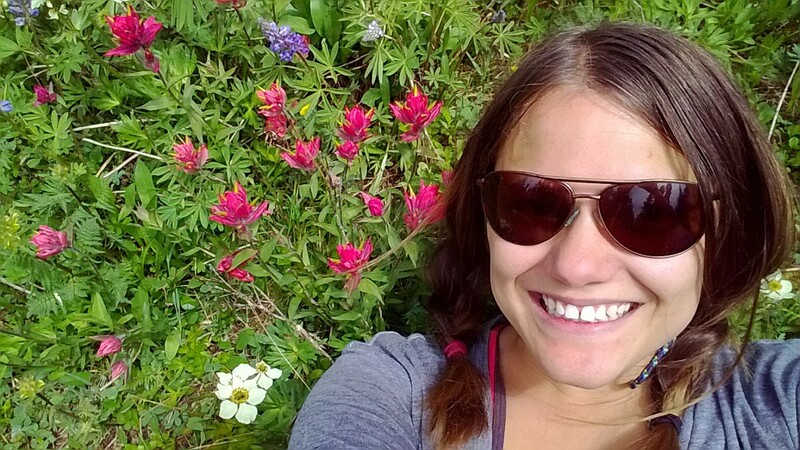 I chose this mellow hike from The Summit County Explorer website because I was not quite over the hump of illness & I wasn’t sure that I could handle any extreme altitude gain or a long distance trek. With a little over 4 miles roundtrip, and an elevation gain of 650′, I knew even this “beginner hike” would be a struggle compared to spending the last few days battling a fever & wrapped in my bedsheets. Slowly & step by step by heavy head fell into rhythm and followed Pete & Calley up the pass. The trail was tickled with flowers, and quiet streams trickled across the path. It was easy to forget my ailments and get lost in the scenery. 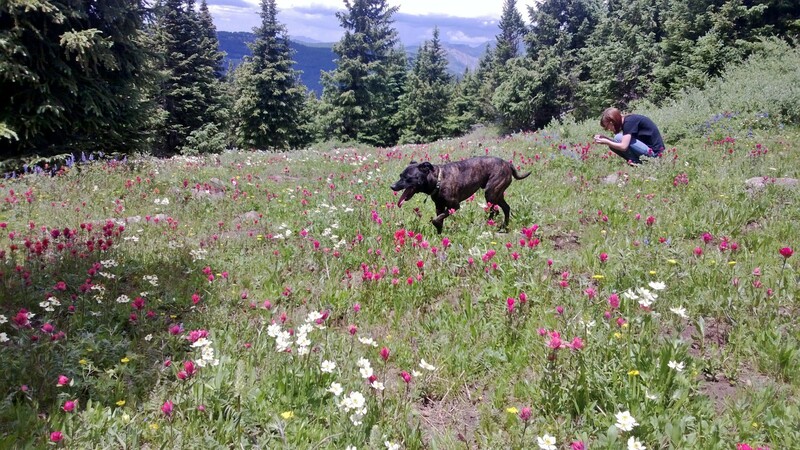 Once we ascended to the top, we continued until we found a brilliant meadow untouched by people or puppies and lounged among the wildflowers for a spell. After taking more photographs than I ever thought possible on a hike of this length, we were soon chased out by buzzing bumble bees. 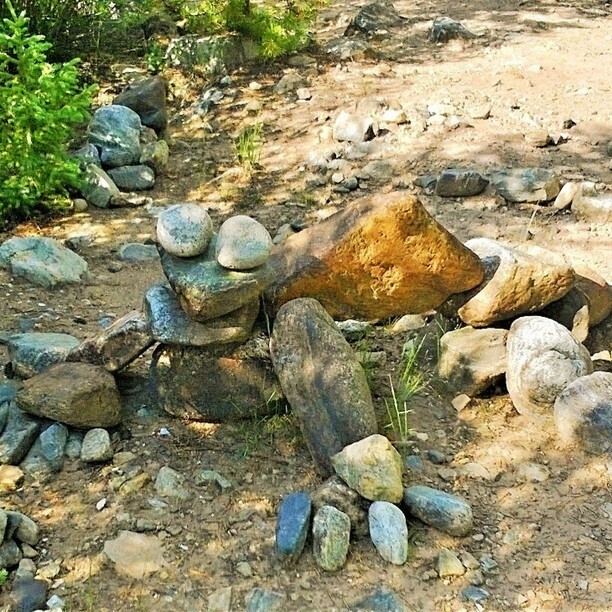 Shrine Mountain Trail is easy to access and easy to summit. 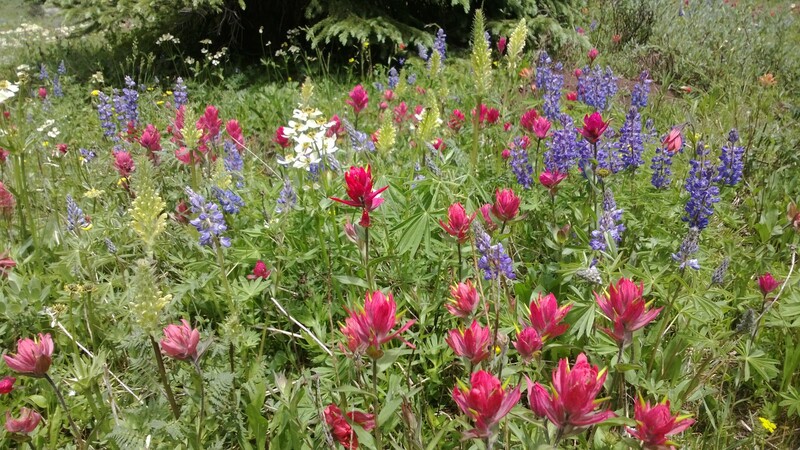 Recommended for families, beginner hikers, or anyone who wants a mellow Summer hike and a chance to view the most incredible arrangements of wildflowers! 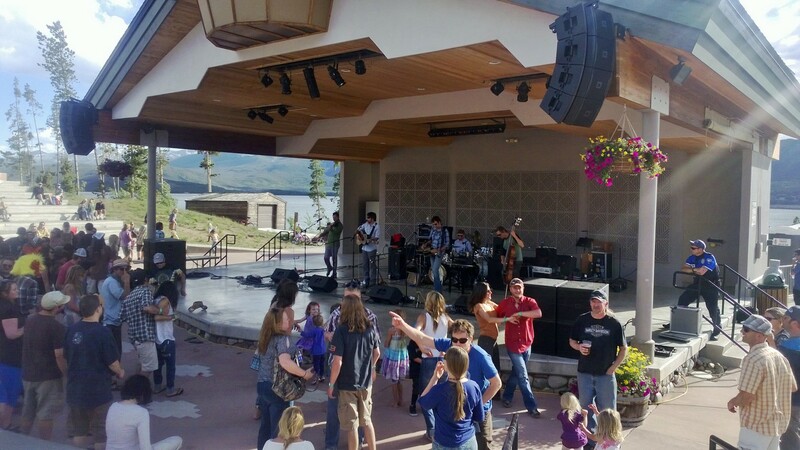 Outdoor music venues are an essential element of Summer, and Colorado has no shortage of magical & beautifully natural spaces to see your favorite bands. 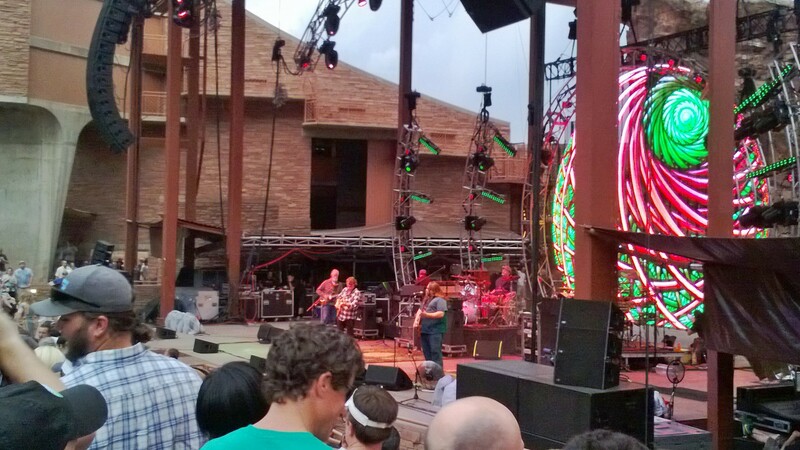 This weekend I was lucky enough to see Widespread Panic at Red Rocks and Dark Star Orchestra at Statebridge. Both music venues are truly spectacular places to visit, regardless of whether or not music is playing. The towering slanted pillars of red rocks greet you as you pull into the park and drive the windy roads up to the parking lots, full with smiling fans. Widespread Panic at Red Rocks sold out in a few hours, and I was blessed with a surprise ticket by a good friend a week before the show. Miracles do happen! It was my first Panic show, not counting festivals like Bonnaroo & Mountain Jam, where I have seen them a few times, and I was very impressed, to say the very least. As a young Phish fan about to see her 50th show this week, I truly love the cult following jam bands have among their fans. This is apparent when the band plays specific songs like “Chilly Water”, and the audience instinctively reacts by throwing water in the air. Although my knowledge of Panic songs is shamefully limited, I did enjoy the few covers that they rocked, like “Cream Puff War” and “Heaven”. 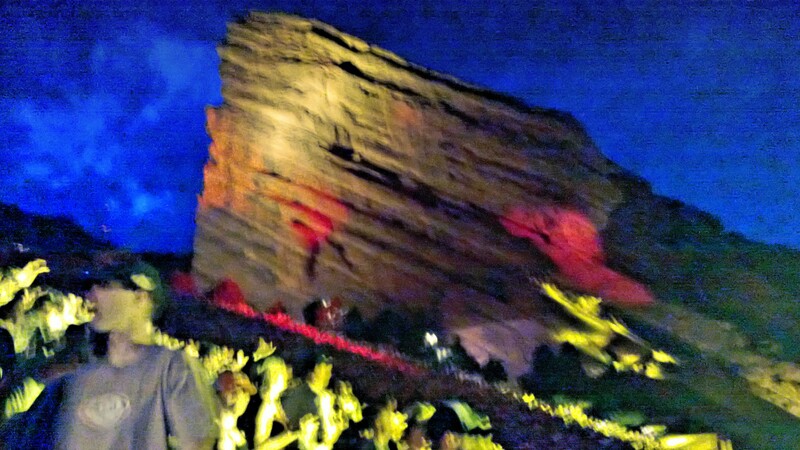 The real highlight of the show came in the 2nd set, when the sky around Red Rocks was lit up with lightening. There is really nothing to compare it to, but seeing a band jam out while lightening is striking down in the distance on the Denver skyline was a beautiful and humbling experience. I thought seeing them a few weeks ago in the pouring rain at Mountain Jam was special, but this was a whole new level. Summit County is a central location for outdoor activities like whitewater rafting, with plenty of commercial companies to choose from. 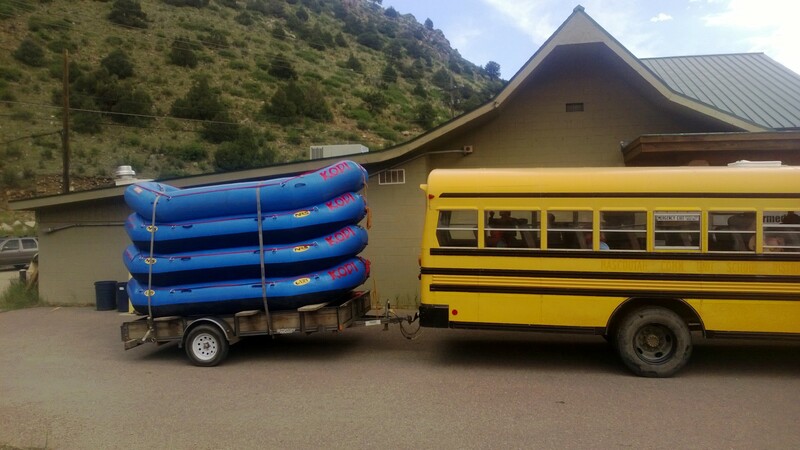 Since I’m a big fan of supporting locally owned, family operated businesses, KODI Rafting was the way to go, plus their Trip Advisor page has some stellar reviews. My friend Emily and I opted to do the Clear Creek intermediate section, since we had both been whitewater rafting before and we wanted a little more excitement! We slipped (okay yanked, pulled, and wiggled) into our wet suits, buckled our PFD’s, and wiggled our toes in the booties. I was very thankful for the splash jackets/ wet suits because the water felt pretty cold as it splashed my face. Our guide, Josh brought us carefully down rapids like Nomad, Deliverance, and Fall River and we got to cruise through the old mining town of Idaho Springs. I love getting to know everyone in the boat through the questions Josh asked and the conversation sparked from the answers. One of the girls in the boat had a startling scream that she seemed to project every time any she felt any water, which made us all giggle. The traffic/ construction work going on at the Idaho Springs tunnels didn’t seem to interfere with our trip timings, but it did make for some interesting sights… truly Urban rafting at it’s finest. It was a 1/3 day trip and we were done by early afternoon & exhausted from a long weekend of KODI activites (SUP on Saturday and rafting on Sunday). We went home, popped in a dvd (or 2) and alternated between napping and snacking for the rest of the afternoon, cause we deserved it! 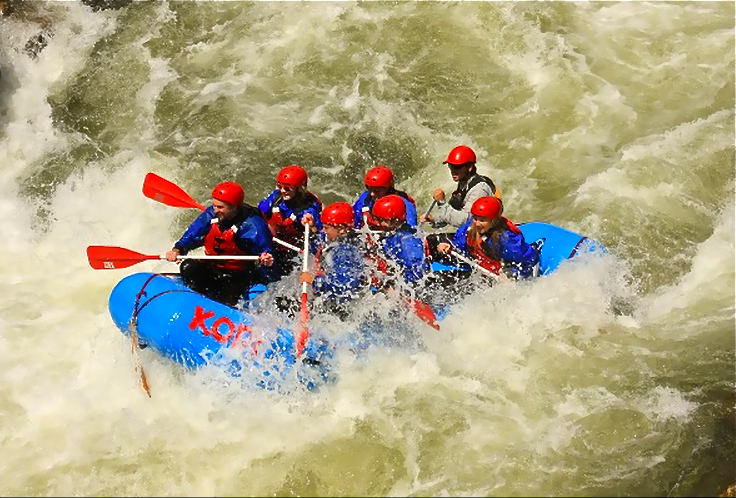 Splashy fun on Clear Creek with KODI Rafting! What’s SUP in Summit County? Last weekend I had a true Colorado weekend and was able to enjoy the spoils of living in Summit County. My friend Emily came to visit as a stop on her soul searching, exploratory phase of her post graduate life, and we took this opportunity to romp around and get a full weekend of the Rocky Mountain experience. Saturday morning we woke up, made a delicious breakfast, gluten free, dairy free, egg free and fruit free for me (GAG), and took Dutchie for a walk into the town of Breckenridge. As we were padding the gondola parking lot, I was inspired to take it up to the base of Peak 8 instead of strolling the streets, so we jumped on and enjoyed the views of Breck from above. We took a quick walk up one of the trails to see the Gold Runner Roller coaster, and then rode the gondola back down to continue on with our Saturday plans. It was just a quickie. The plan was to rent Stand Up Paddleboards (SUP) from KODI Rafting in Frisco, and paddle across the lake to the Dillon Marina to enjoy the brews & bluegrass festival going on there that evening. Slowly, we made our way over to KODI, leisurely arriving to pick up our boards at 2pm. The afternoon brought some serious wind action, and as someone who has never tried Stand Up Paddleboarding before, I was very intimidated. We quickly changed our plans and decided to drop in at the Dillon Marina, paddle around and then go boogie to bluegrass. SUPing in the wind was extremely difficult, but also a really rewarding feeling. Gliding across the lake propelled forward only by movements of your own body and limited only by your own capabilities (okay and also the wind) was a humbling experience. I will definitely do it again on a less blustery day, if nothing else than for an awesome motivating work-out! No weekend is complete without some form of live music, be it a concert, street performance, or even streaming live shows from around the country. 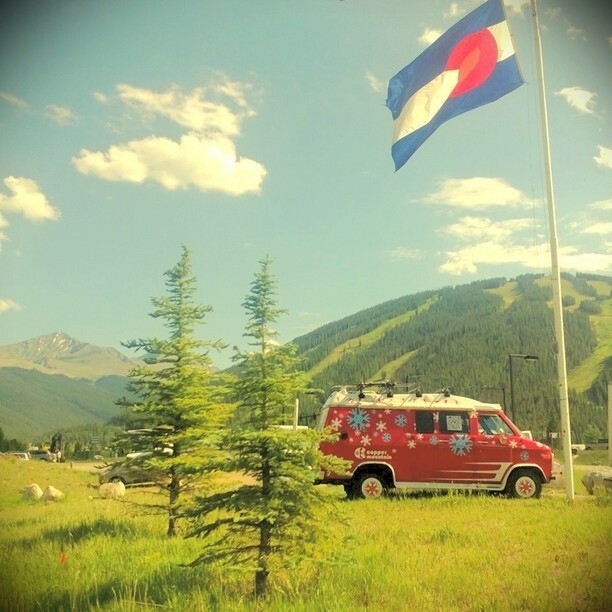 We returned the paddleboards and headed to the Dillon Amphitheater to catch some bluegrass from Hot Buttered Rum and some Grateful Dead classics by The Rocky Mountain Grateful Dead Revue . We drank whiskey, hula hooped, sang along, and went to bed dreaming of whitewater rafting the next day. 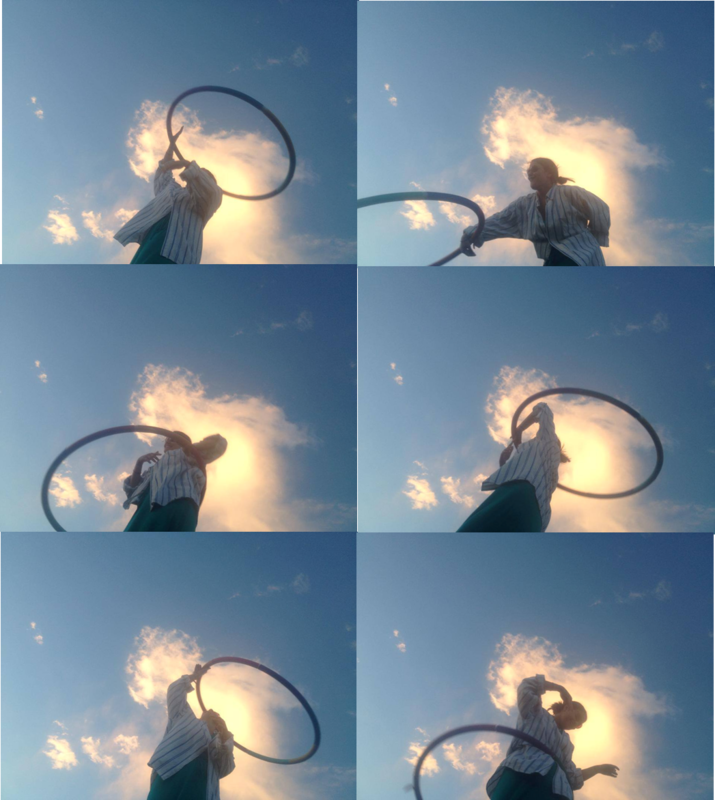 Montage of me hula hooping to Rocky Mountain Grateful Dead Revue!